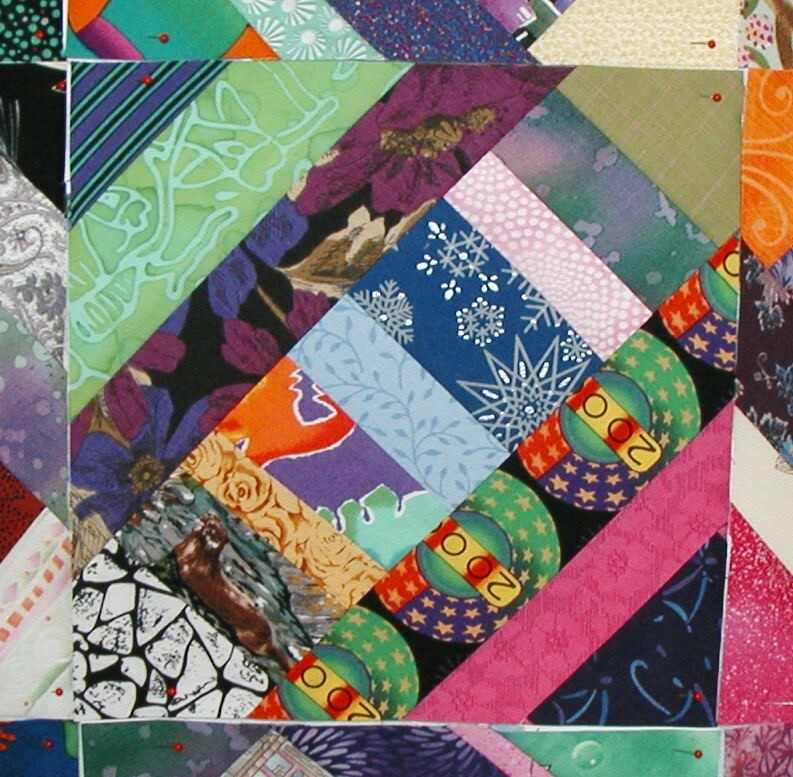 This is not my quilt–it was made by my friend Nita, whom I’ve never actually met in person. She’s one of my online Artist’s Way buddies. 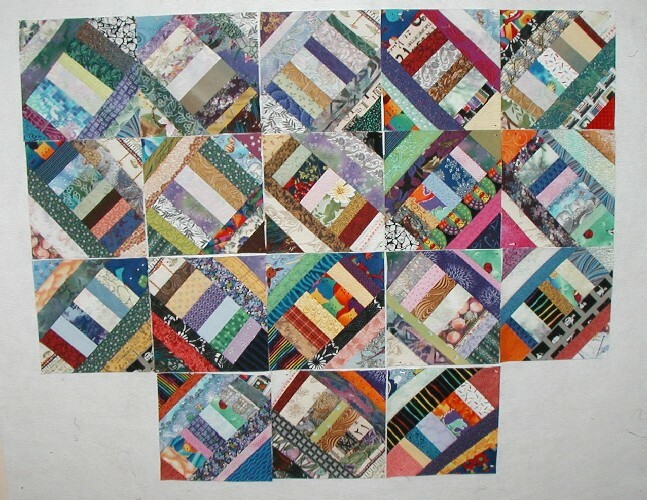 While I didn’t make the quilt, I did make some of the blocks. 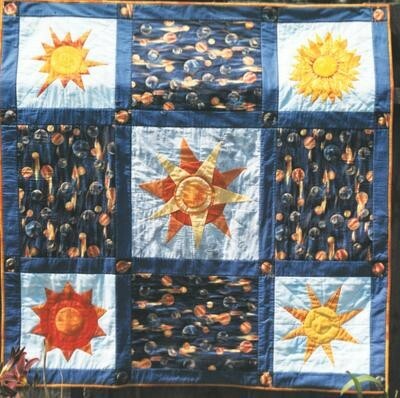 Nita did the illustration for an article Mr. Karen wrote about a kayak trip for a whitewater magazine, and I did the four suns that now grace the corners of this quilt in exchange for all the work she did on the drawing. I like the way Nita’s center block echoes the colors and shapes in mine and ties the whole thing together. I had fun figuring out the patterns for those blocks. 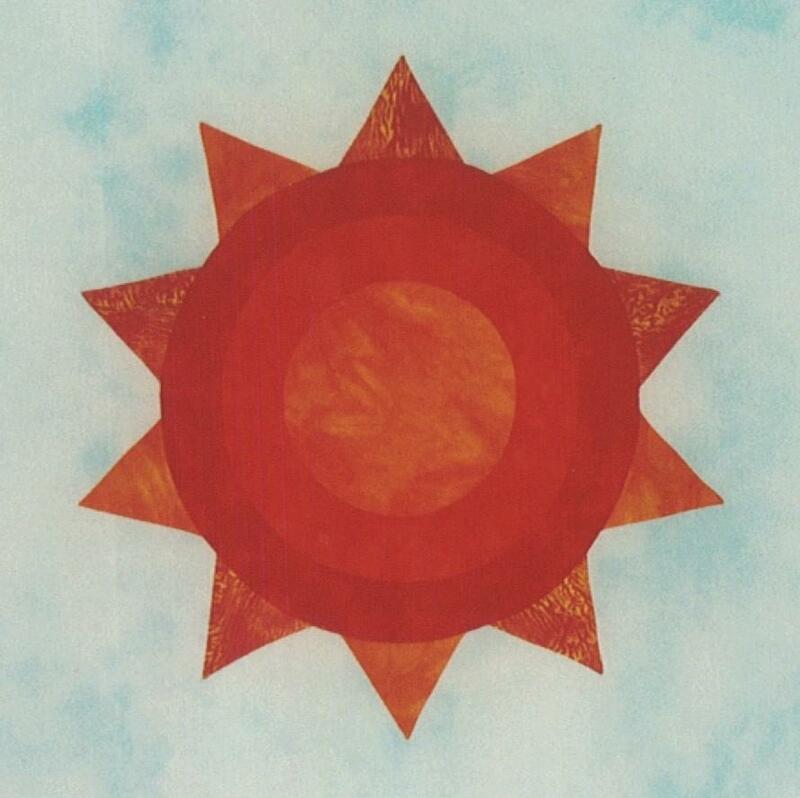 The comic book style sun and the round, fat sun were based on designs that came with Electric Quilt 4. 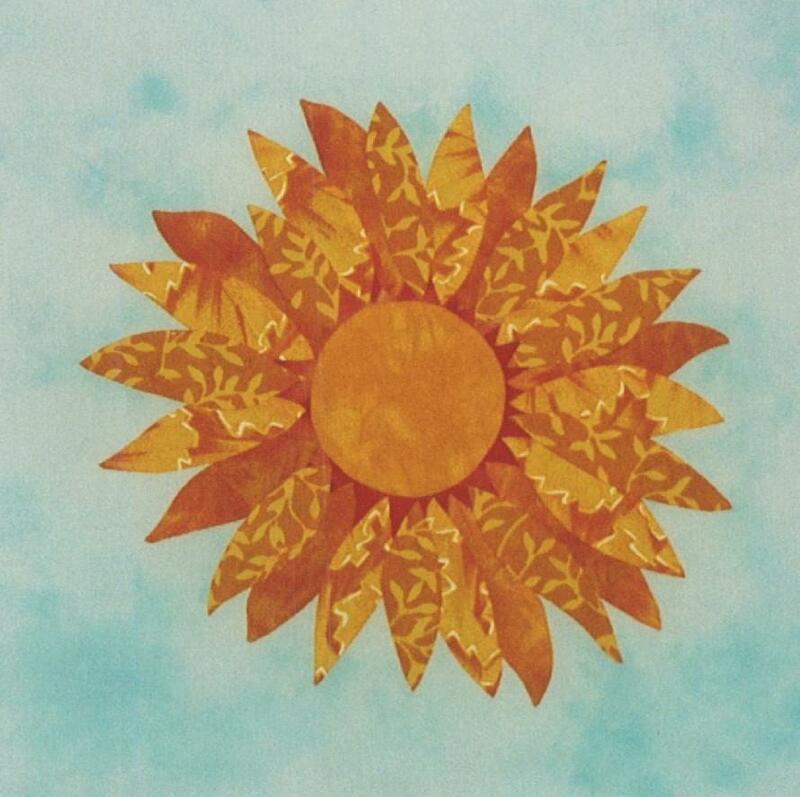 The flowery sun was inspired by the book Applique in Bloom. 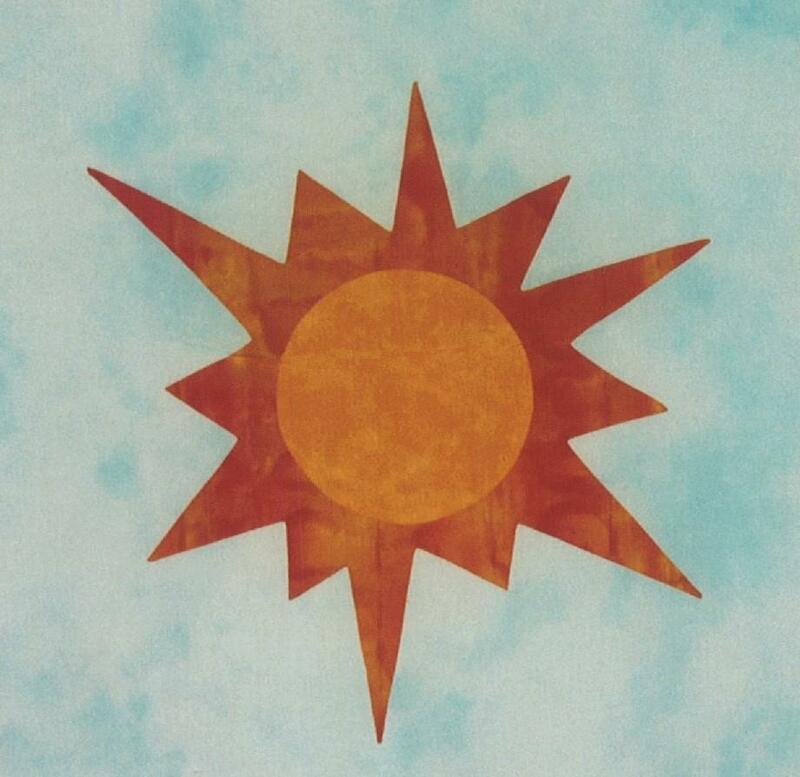 I cut the pattern for the classic, spiky sun using the paper snowflake method, basing the general off of a sun motif on a piece of yardage in my stash. 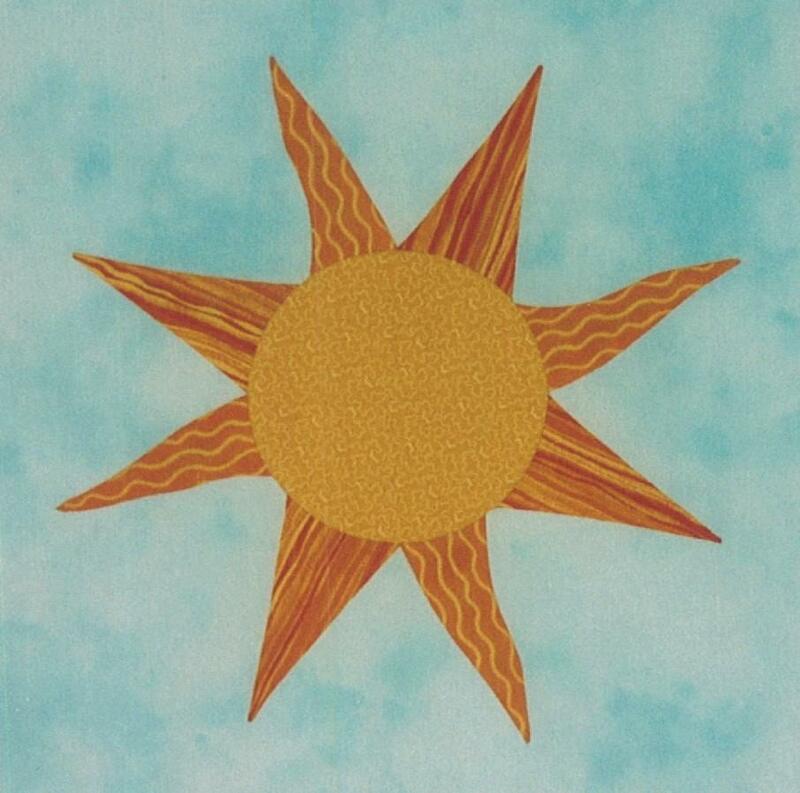 Seeing them all again (I had to dig the pictures out of my files, because I did them in pre-digicam days), I’m once again reminded that I want to do more hand applique (something other than attaching labels to the back of quilts, that is). A project like that could be portable, something I could work on when I’m away from my sewing machine. I just need to find the time to plan it and prepare the pieces. Given how crowded my quilting to do list is right now, it might be a while before I can get to it. Maybe I should move some things around a little, since once I’ve gotten past the prep work, I could work on it during times I wouldn’t be working on my other projects anyway. One of those other projects I’ve been working on lately is my first-ever block swap. 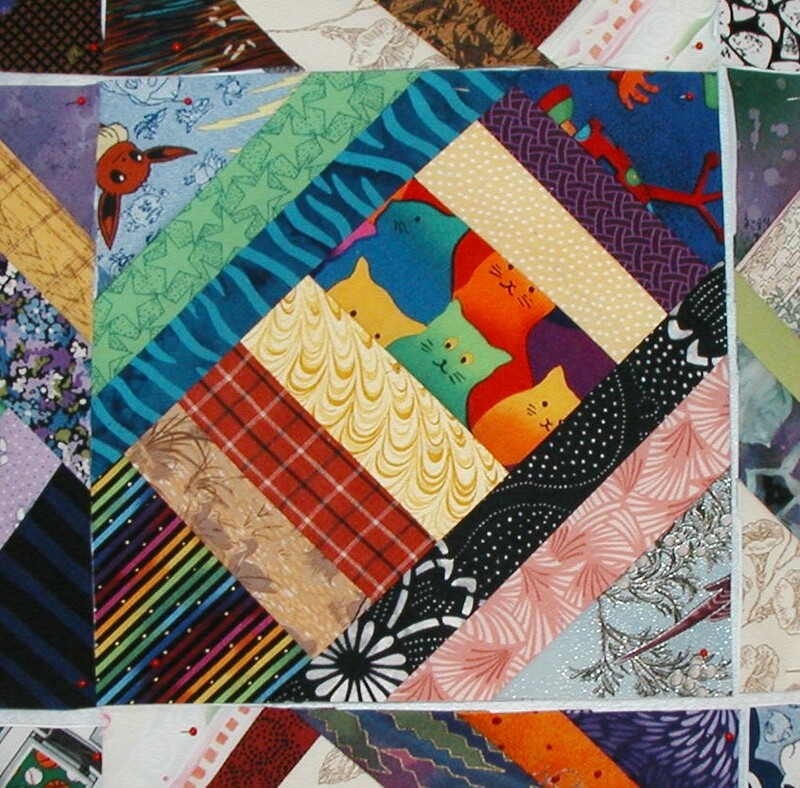 Eight quilters around the country are making sets of blocks from this pattern, then we’ll send them to the woman who’s coordinating the swap and she’ll send us back other people’s blocks. I’m excited about this because it’s true scrap quilting–not just scrap-look quilting where I take tens of fabrics off the shelves and cut small amounts of each one, but legitimately using leftover snips and strips from other projects. 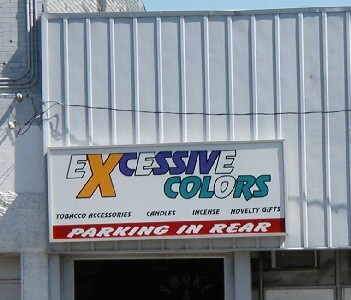 Finally, I can justify all those odd bits I’ve saved! I went through my big hatbox of scraps and sorted the mostly strip-like ones into three brown paper grocery sacks for light, medium, and dark values. It was fun to remember the projects they’d come from–the baby quilts, the wall hanging I did for a friend from work, the colorwash star. When I sewed the blocks, I tried to vary the values of adjacent strips but not worry about the colors coordinating, which is very contrary to how I usually work. It was hard, and I when I finished the first few blocks I thought they were very ugly indeed. Once I’d finished all of them and put them together on my felt wall, I liked them better. Because I made extras in case of mistakes, I had to pick two to keep. This one had to stay with me because the last strip I added (the dark one in the lower right) wasn’t quite long enough. The seam allowance should cover that, but I didn’t want anyone else to have to deal with my slip-up. It’s just a bonus that this block happens to have an otter in it. I chose the other one I’m keeping because it amuses me that there’s a cat looking down at some ducks a few strips below. The Pokemon in corner are pretty silly, too. I’m looking forward to seeing what everyone else’s blocks look like, so I guess I need to get moving and package mine up so I can get them in before the swap deadline. When I was going through my pictures to find the swap blocks, I came across this one that I took of a store sign in Peoria when Mom and I were there for the quilt show–that’s a quilt title just waiting to for a quilt to go with it. One year ago, I finally felt up to writing my surgery story. Two years ago, I was going through a box of memories.